Who doesn’t love a good pancake? I’m talking that rich, decadent stack of buttermilk pancakes from that old hole-in-the-wall diner. Warm maple syrup. Melted butter. I crave pancakes all the time. But then I eat them, and I am never satisfied! I always want something more. I start to feel guilty because I probably consumed about a thousand calories already, and I’m still hungry! 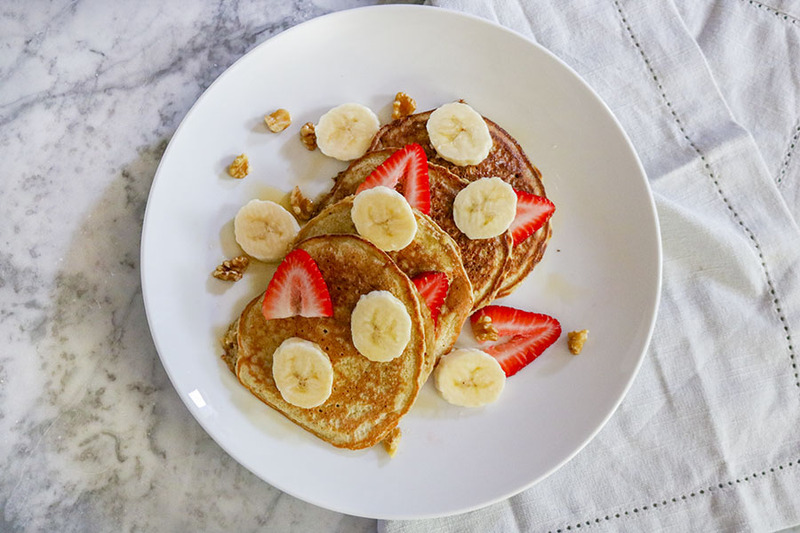 That is why I developed this recipe for Healthy Banana Oatmeal Pancakes. 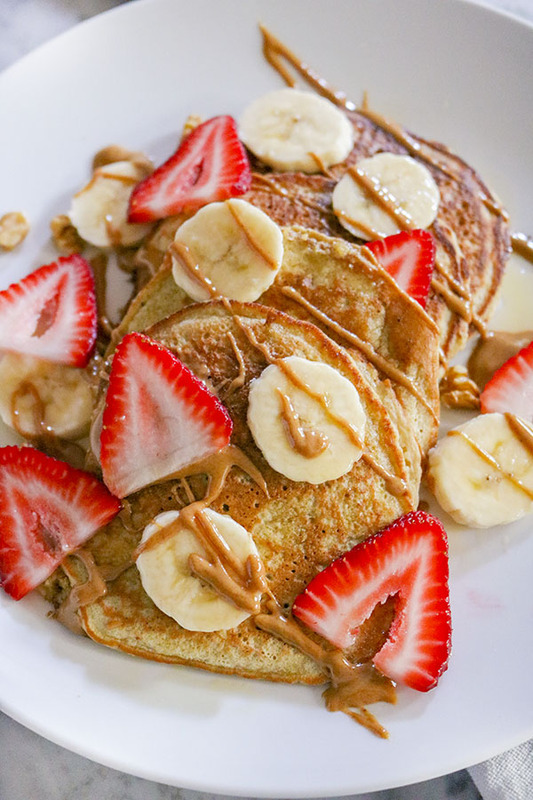 Because in this case, you can have your pancake and eat it too! Pancakes are a funny thing. Everyone has heard of a pancake – but my ultimate pancake might be COMPLETELY different from your ultimate pancake. 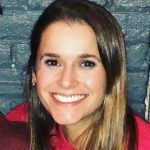 There are healthy pancakes, unhealthy pancakes, flavored pancakes, plain pancakes, European pancakes, American pancakes, thick pancakes, thin pancakes, the list goes on FOREVER! Personally, I like fluffy, American-style pancakes. I like a simple-base flavor, such as buttermilk or multigrain, and then I like to load up the toppings. Bananas, strawberries, maple syrup, whipped cream, peanut butter, chocolate – all the good stuff. 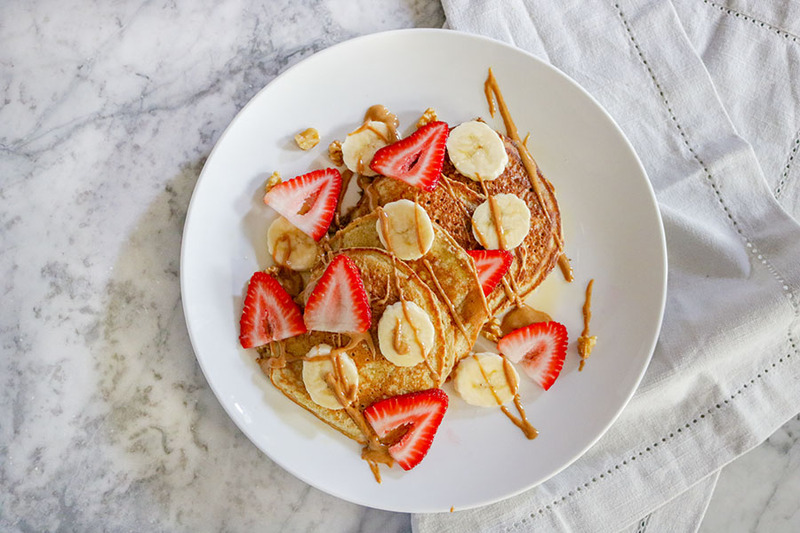 When you are trying to make a healthy pancake, it can be challenging to get that same wonderful fluffy texture that you would get in a buttermilk pancake. Limiting ingredients such as cream, flour, and eggs can also lead to crumbly pancakes. And who wants a crumbly pancake? Using ingredients like banana and egg whites are GREAT to help bind the pancake together. I also love to blend my oats in order to develop a more flour-like textured substance for my pancake. I can’t even try to pretend these pancakes will be better than your grandma’s – because she probably used all the good stuff. BUT, they are pretty darn delicious AND better yet, they are healthy! 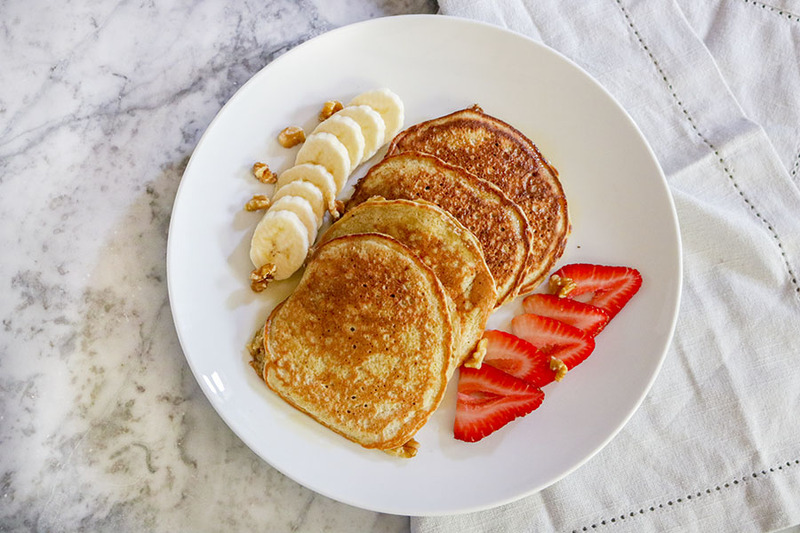 These Healthy Banana Oatmeal Pancakes are thick, fluffy, and flavorful, with just a slight hint of banana! They taste incredible with maple syrup, peanut butter, almond butter, or even your favorite preserves! I love to top mine with some additional sliced bananas or fresh strawberries because YUM! Enjoy them in a large stack, or as a small snack! No joke, I brought a baggy with me to the airport the other day and just ate them cold… perhaps that’s gross. But I really enjoyed myself! Try the recipe as-is or spice things up with a little cinnamon, blueberries or chocolate chips! I promise your belly and your brain are gonna love these fluffy little flap jacks of joy! 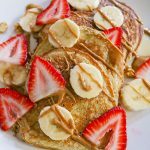 These Healthy Banana Oatmeal Pancakes are thick, rich, and flavorful, with just a slight hint of banana! They taste incredible with maple syrup, nut butter, or even your favorite preserves! I love to top mine with some additional sliced bananas or fresh strawberries! Enjoy them in a large stack, or as a small snack! Heat skillet over medium heat. Lightly grease with non-stick cooking spray, butter, or ghee. Pour pancake batter onto skillet, cooking for 2-3 minutes on one side. Then flipping to cook an additional 1-2 minutes on the other side. 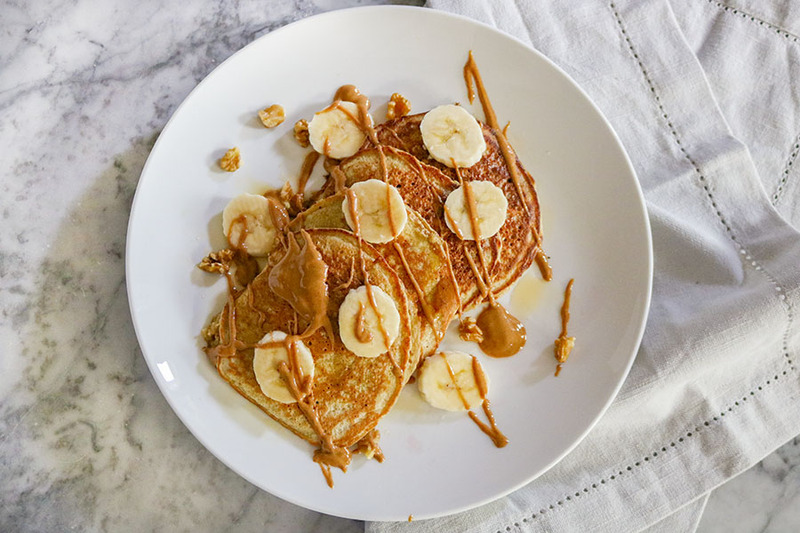 Drizzle with maple syrup or peanut butter then top with whatever else your heart desires! Storage: Best enjoyed right away. Refrigerate pancakes separately from toppings in an airtight container for 2-3 days. Note: Recipe adapted from an original recipe by Modern Honey.